Brussels, particularly the central area near Grand Place, is really beautiful. I visited the city on a trip around Europe with a couple of friends, between stays in Antwerp and Berlin. We stayed at the Floris Hotel Arlequin Grand Place, a short walk from Brussels Central station and conveniently located near Grand Place. It was a three-person room in a renovated building with an upstairs loft and windows overlooking the alley below. While wandering around, we came across Galeries Royales Saint-Hubert. It's the area's central shopping mall, and had a bunch of luxury shops and random boutiques under a beautiful, enclosed, glass ceiling. While there were a lot of tourists exploring the city, it was never overwhelming. The only time that there was an over-abundance of tourists crowding in an area was on our walk to check out the Manneken PIs, the famous Brussels statues of little boys peeing. Odd when you think about it, but if you're in town, it's just one of those things that you have to check out. Brussels overall was gorgeous and a great stop, but we did have an issue at a restaurant a block away from Grand Place. We went to get some mussels, famous in the country, and weren't exactly given an honest price. The bill was a bit of a shock. When we were getting seated, we noticed a pissed off group of tourists getting ready to leave - they were probably mad about the same thing. I don't remember what the name of the place was, unfortunately, but just make sure you're extra clear on the prices you'll be paying. 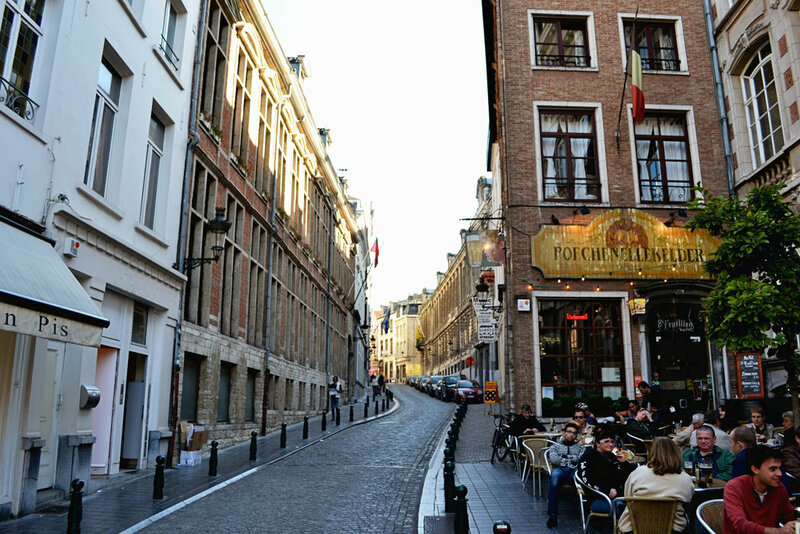 Walk the alleys, grab a seat at an outdoor cafe, eat some waffles (try Waffle Factory), and find some good chocolate. And last but not least, if you're lucky enough to be in the city on a clear night, do spend some time in Grand Place (photo at the top). It would've been nice to have more time to really explore the city, of course, but given that we had a limited amount of time to split between each European destination on our itinerary, 1.5 days in Brussels seemed to be about right. It's already internationally famous, but Pierre Marcolini was started right here in Brussels. Their shop here is a lot bigger than the others that I've seen - 2 full floors of chocolates of all types. I went with some assorted packs and a chocolate-covered marshmallow. There's a bunch of other good chocolate shops nearby but you can't go wrong with this one. Delirium is a popular bar near Grand Place. The basement is really lively, sometimes with live music, and they serve a few thousand different types of beer. No joke - they apparently set a world record. There are a few tables in the alley outside, which we opted for, if you want to sit down and be able to hear the conversation you're having. Definitely a good spot to try out some Belgian beers. Follow their pink elephant logo.